Why do I bother? really....for the same price, I could have had some of the ever growing line up of Stone Ridge Creamery ice creams. It's my own fault, I had fun with berries and thought maybe Hood could crank out a half decent flavor. Well, I was wrong, I just don't like it. I'm sure some people will enjoy the cheap blueberry muffin taste, but I'm just not in the mood for it. Guess I was hoping for less blueberry and more sweet cream. The picture shows just the blueberry ice cream on top, but as you dig down, you will discover swirls of sweet cream ice cream as well. Oh well, at least it's a low cal flavor. Actually, I just had a flash back to childhood. When all else fails, bury it in chocolate until that's all you can taste. I really do hate to waste ice cream, but I'm not going to have any urge to eat this stuff ...I know, I know, I'm being harsh, it's just that I'm unamused and I want my $3 back. I am sorry to say I have not tried that particular flavor of Hood ice cream. The store has a promotion on a few Hood flaors just now $1.77 GREAT deal I thought. Bluech! Its gross. Chocolate fudge flavor that is seriously lacking in the choc flavor dept and the fudge pieces are like lumps of plastic. NO KIDDING. Never again, even at $1.77 I wish I hadn't bought it. 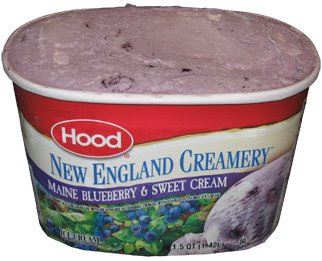 I tried maine blueberry and creamy vanilla. Oh my. It was delicious. I only wish I could find it in NC.